The holy Yamdrok Yumtso Lake lies to the south of Yarlong Tsangpo River in the Shannan Region of Tibet. 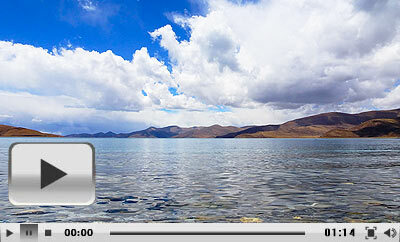 It is one of three holy lakes in Tibet. As the largest freshwater lake at the south foot of the Himalayas with an area of about 638 square kilometers (about 246 square miles), it is in a length of 130 kilometers (about 81 miles) and a width of 70 kilometers (about 43 miles). Its surface is about 4,441 meters (about 14,570 feet) above the sea level. It is quite deep as the average depth is about 20-40 meters (about 11-22 fathoms) and the deepest point is almost 60 meters (about 33 fathoms) below the surface. The Yamdrok Yumtso Lake has some beautiful and vivid names like Coral Lake or Green Jade Lake. The former name is derived from its irregular shape, as the lake has many short streams winding into the nearby mountains and it appears much like the coral. The latter name implies its beautiful appearance for pure clean water there is as smooth as the surface of fine jade. Lying under the sunshine, the peaceful water seems like a bright mirror. The reflection of sunshine in different depths lends the lake gorgeous and mysterious colors. Overlooked from the nearby high mountain, one could see the Yamdrok Yumtso Lake, like a holy sapphire, set in the group of mountains. In the lake, are dotted several small islands. On the islands, fertile grasses and groups of wild birds betray peaceful but vigorous natural scenery. Embraced by the uninterrupted snow-capped mountains and lying under the clear blue sky, the Yamdrok Yumtso Lake appears very holy and evokes solemnity. Yamdrok Yumtso Lake is also said to be the female Guardian of Buddhism in Tibet. People here believe that it will bless and protect them. Every year, many devotional followers in Tibet or from other places would come here for pilgrimage. Some of them start on foot and give one prostration every three steps even from hundreds of kilometers away. All of these visitors bring much mystery and dignity to the charming holy Yamdrok Yumtso Lake. There is no public bus available, and visitors need to hire a lcoal car. The fare for a round-trip is CNY 1,300 - 1,600. Free entrance from Nov. 1, 2018 to Mar. 15, 2019. In the Zaqi District, to the east of Zanang River in the Zanang County, lies the Mindroling Monastery which covers a large area of over 100,000 square meters (approx. 119,599 square yards). It is one of the six most famous Tibetan Buddhism monasteries of the Nyingmapa Sect. Mindroling Monastery was originally built in the late 10th century and has been renovated several times. Surrounded by hills, Mindroling Monastery was built facing east. Its biggest hall is named Guihuakang and the main hall is Lakhang Buddhist Hall. Lakhang Buddhist Hall is three stories high. The Main Assembly Hall is on the first floor, the second floor has five small Buddhist Halls and monks’ residence, and the third floor has another two Buddhist halls. The paintings depicting various Buddhist figures are on the wall of the main hall. Each of the figures owns many heads, many arms and appears in threatening and horrible situations. That is because according to the Tibetan Buddhism, the horrible looking figures are guardians who prevent the monastery from being attacked by enemies and evil. The studies of astronomy and calendared calculation are stressed in the temple. Besides that, Mindroling Monastery also works on presiding over the compilation of the Tibetan calendar and Tibetan books. Unlike many other monasteries, the monks in Mindroling Monastery are allowed to get married and bear children. The succession of the abbot in it is not limited within the relationship of son and father. Either the relationship of son and father or son-in-law and father-in-law is acceptable. The study of this phenomenon is very useful in studying the rise, development and decline of the Nyingmapa Sect. Take a bus from Lhasa Xijiao Bus Station to Tsedang Town first and then hire a lcao car to the monastery.